The Grameen Bank (Bengali: গ্রামীণ ব্যাংক) is a microfinance organization and community development bank started in Bangladesh that makes small loans (known as microcredit or "grameencredit") to the impoverished without requiring collateral. The word "Grameen," derived from the word "gram," means "of the village." The bank's system is based on the idea that the poor have skills that have been under-utilized. A group-based credit approach utilizes the peer-pressure within the group to ensure the borrowers follow credit discipline. The bank also accepts deposits, provides services, and operates several development-oriented businesses including fabric, telephone, and energy companies. Remarkably, women are a significant majority of borrowers the bank's credit program. The origin of Grameen Bank traces back to 1976. Muhammad Yunus, a professor at the University of Chittagong, launched a research project to examine the possibility of designing a credit delivery system to provide banking services targeted to the rural poor. In October 1983, government legislation transformed the Grameen Bank Project into an independent bank. The organization and its founder, Yunus, were jointly awarded the Nobel Peace Prize in 2006. 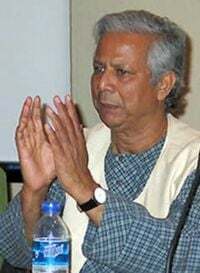 In 2011, the Bangladesh Government forced Yunus to resign from Grameen Bank, saying that at age 72, he was years beyond the legal limit for the position. The bank has earned well-deserved attention for introducing a novel concept in the area of finance. Prior to the inauguration of Grameen Bank, financial institutions showed great reluctance in providing loans to the poor. They have little or no collateral to guard against loan default. Compounded, they have little or no training or education in schools to make them reasonable investment risks. Probably most damaging, a popular stereotype casting them as lazy, unreliable, and ignorant has prevailed. The Grameen Bank has broken those stereotypes by extending micro-loans that the poor have consistently repaid. The success of Grameen Bank has provided an alternative to governments merely awarding welfare money to the poor by giving the poor incentive to make a profit from their labor and innovation. Muhammad Yunus, the bank's founder, earned a doctorate in economics from Vanderbilt University in the United States. The terrible Bangladesh famine of 1974 prompted him to make a small loan of USD 27 to a group of 42 families so that they could create small items for sale without the burdens of predatory lending. 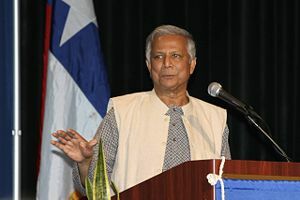 Yunus believed that making such loans available to a wide population would have a positive impact on the rampant rural poverty in Bangladesh. The Grameen Bank (literally, "Bank of the Villages," in Bangla) grew out of Yunus' ideas. The bank began as a research project by Yunus and the Rural Economics Project at Bangladesh's University of Chittagong to test his method for providing credit and banking services to the rural poor. In 1976, the village of Jobra and other villages surrounding the University of Chittagong became the first areas eligible for service from Grameen Bank. The Bank became immensely successful and the project, with support from the central Bangladesh Bank, extended in 1979 to the Tangail District (to the north of the capital, Dhaka). Bankers from ShoreBank, a community development bank in Chicago, helped Yunus with the official incorporation of the bank under a grant from the Ford Foundation. The bank's repayment rate suffered following the 1998 flood of Bangladesh before recovering again in subsequent years. By the beginning of 2005, the bank had loaned over US$4.7 billion to the poor. The Bank today continues to expand across the nation and still provides small loans to the rural poor. By 2006, Grameen Bank branches numbered over 2,100. Its success has inspired similar projects in more than 40 countries around the world and became a model for World Bank initiatives to finance Grameen-type schemes. The bank gets its funding from different sources, and the main contributors have shifted over time. In the initial years, donor agencies used to provide the bulk of capital at extremely low rates. In the mid-1990s, the bank started to get most of its funding from the central bank of Bangladesh. More recently, Grameen has started bond sales as a source of finance. The bonds implicitly receive subsides as the government of Bangladesh guarantees the loans. We shall follow and advance the four principles of Grameen Bank: Discipline, Unity, Courage and Hard work—in all walks of our lives. We shall not live in dilapidated houses. We shall repair our houses and work towards constructing new houses at the earliest time. During the plantation seasons, we shall plant as many seedlings as possible. We shall educate our children and ensure that they can earn enough to pay for their education. We shall drink water from tubewells. If it is not available, we shall boil water for use. We shall not take any dowry at our sons' weddings, neither shall we give any dowry at our daughter's wedding. We shall keep our center free from the curse of dowry. We shall not practice child marriage. We shall collectively undertake bigger investments for higher incomes. We shall always be ready to help each other. If anyone is in difficulty, we shall all help him or her. If we come to know of any breach of discipline in any center, we shall all go there and help restore discipline. We shall take part in all social activities collectively. Grameen Bank has become best known for its system of solidarity lending. The Bank also incorporates a set of values embodied in Bangladesh by the "Sixteen Decisions." At every branch of Grameen Bank the borrowers recite those Decisions and vow to follow them. As a result of the Sixteen Decisions, Grameen borrowers have been encouraged to adopt positive social habits. One such habit includes educating children by sending them to school. Since the Grameen Bank embraced the Sixteen Decisions, almost all Grameen borrowers have their school-age children enrolled in regular classes. That, in turn, helps foster social change, and educate the next generation. Solidarity lending constitutes a cornerstone of microcredit and the system works in over 43 countries. Although each borrower must belong to a five-member group, the group has discretion on approving loans to its members. Repayment responsibility rests solely with the individual borrower, while the group and the center oversees everyone's responsible behavior, ensuring that none gets into a repayment problem. Although technically the group enjoys freedom from enforced joint liability (that is, group members obligation to pay on behalf of a defaulting member), in practice the group members often contribute the defaulted amount with an intention of collecting the money from the defaulted member at a later time. Grameen's policy of refusing any further credit to a group in which a member defaults encourages such behavior. Without a legal instrument between Grameen Bank and its borrowers, the system works based entirely on trust. To supplement the lending, Grameen Bank also requires the borrowing members to save small amounts regularly in a number of funds like an emergency fund and a group fund. Those savings help serve as insurance against unexpected contingencies. In a country in which few women may take out loans from large commercial banks, Grameen has focused on women borrowers, as 97 percent of its members are women. In other areas, Grameen's track record has also been notable, with an extremely high payback rate—over 98 percent. According to the Wall Street Journal, a fifth of the bank's loans had been more than a year overdue in 2001. Grameen claims that more than half of its borrowers in Bangladesh (close to 50 million) have risen out of acute poverty thanks to their loans, as measured by such standards as having all children of school age in school, all household members eating three meals a day, a sanitary toilet, a rainproof house, clean drinking water and the ability to repay a 300 taka-a-week (around four USD) loan. Grameen has created a new class of women entrepreneurs who have raised themselves from poverty. Moreover, it has improved the livelihoods of farmers and others who are provided access to critical market information and lifeline communications previously unattainable in some 28,000 villages of Bangladesh. More than 55,000 phones are currently in operation, with more than 80 million people benefiting from access to market information, news from relatives, and more. In 2003, Grameen Bank started a new program, different from its traditional group-based lending, exclusively targeted to the beggars in Bangladesh. That program focuses on distributing small loans to beggars. With the existing rules of banking suspended, the completely interest-free loans can have arbitrarily long repayment periods. For example, a beggar taking a small loan of around 100 taka (about US$1.50) can pay only 2.00 taka (about 3.4 U.S. cents) per week and furthermore the borrower receives free life insurance coverage. The bank allows borrowers to continue begging, encouraging them to use the loans for generating income by selling low-priced items. Based on a paper presented in the Global Microcredit Summit in 2006 by one of the bank's managers, as of May 2006, around 73,000 beggars have taken loans of about Tk 58.32 million (approx. US$833,150) and repaid Tk. 34.78 million (about US$496,900). Since its inception, the bank has distributed Tk 347.75 billion (USD 6.55 billion) in loans. Out of that, Tk 313.11 billion (USD 5.87 billion) has been repaid. Many critics doubt that recovery rate and the definition that Grameen uses to come up with that rate. From modest beginnings three decades ago, Yunus has, first and foremost through Grameen Bank, developed micro-credit into an ever more important instrument in the struggle against poverty. Grameen Bank has been a source of ideas and models for the many institutions in the field of micro-credit that have sprung up around the world. On December 10, 2006, Mosammat Taslima Begum, who used her first 16-euro (20-dollar) loan from the bank in 1992 to buy a goat and subsequently became a successful entrepreneur and one of the elected board members of the bank, accepted the Nobel Prize on behalf of Grameen Bank's investors and borrowers at the prize awarding ceremony held at Oslo City Hall. Grameen Bank stands as the only business corporation to have won a Nobel Prize. In a speech given at the presentation ceremony, Professor Ole Danbolt Mjøs, Chairman of the Norwegian Nobel Committee, mentioned that, by giving the prize to Grameen Bank and Muhammad Yunus, the Norwegian Nobel Committee wished to focus attention on dialog with the Muslim world, on the women's perspective, and on the fight against poverty. Celebration welcomed the Nobel prize announcement in Bangladesh. Some critics asserted that the award affirms neoliberalism. The Grameen Bank has spawn over two dozen enterprises represented by the Grameen Family of Enterprises. Those organizations include Grameen Trust, Grameen Fund, Grameen Communications, Grameen Shakti (Grameen Energy), Grameen Telecom, Grameen Shikkha (Grameen Education), Grameen Motsho (Grameen Fisheries), Grameen Baybosa Bikash (Grameen Business Development), Grameen Phone, Grameen Software Limited, Grameen CyberNet Limited, Grameen Knitwear Limited, and Grameen Uddog (owner of the brand Grameen Check). On July 11, 2005, the Grameen Mutual Fund One (GMFO), approved by the Securities and Exchange Commission of Bangladesh, made an Initial Public Offering. One of the first mutual funds of its kind, GMFO will allow the over four million Grameen Bank members, as well as non-members, to buy into Bangladesh's capital markets. The Bank and its constituents combine for a worth of over US$7.4 billion. Americas: Bolivia, Dominican Republic, El Salvador, Haiti, Honduras, Mexico, Peru, U.S.
Sudhirendar Sharma, a development analyst, claims that the Grameen Bank has "landed poor communities in a perpetual debt-trap," and that its ultimate benefit goes to the corporations that sell capital goods and infrastructure to the borrowers. It has also attracted criticism from the former Prime Minister of Bangladesh, Sheikh Hasina, who commented, "There is no difference between usurers [Yunus] and corrupt people." Hasina touches upon one criticism of Grameen Bank: the high rate of interest that the bank demands from those seeking credit. Similar to all microfinance institutes, the Grameen Bank charges higher interest compared to that of traditional banks, as Grameen's interest (reducing balance basis) on its main credit product stands about 20 percent. The Mises Institute's Jeffrey Tucker has criticized the Grameen Bank, asserting that the Grameen Bank and others based on the Grameen model lack economically viability and depend on subsidies to operate, thus essentially becoming another example of welfare. Grameen's Sixteen Decisions has been another target of criticism. Critics say that the bank's Sixteen Decisions force families and borrowers to abide by the rules and regulations set forth by the bank. In response to that, the Grameen bank neither forces or instills its morals into those who decide against becoming a part of the Grameen Bank. Seeing the Grameen Bank as a vehicle out of poverty and abysmal conditions, the Sixteen Decisions represent a means for which to bring about positive social changes, and to better the lives of those who live in poverty. ↑ Anand Giridharas and Keith Bradsher, Microloan Pioneer and His Bank Win Nobel Peace Prize, New York Times. Retrieved September 2, 2008. ↑ Brandon Glenn, ShoreBank leaders had hand in Nobel prize, Chicago Business News. Retrieved September 2, 2008. ↑ Shahidur R. Khandker, M. A. Baqui & Z. H. Khan, Grameen Bank: Performance and Sustainability (World Bank Publications, 1995, ISBN 0821334638). ↑ Jonathan Morduch, The role of subsidies in microfinance: Evidence from the Grameen Bank, Journal of Development Economics 60 (1) (October 1999): 240. ↑ Garda Ghista, 2004, Bangladesh: Towards Economic and Women’s Liberation Via Grameen Bank, ProutWorld. Retrieved September 2, 2008. ↑ Mahabub Hossain, Credit for Alleviation of Rural Poverty: The Grameen Bank in Bangladesh (Int Food Policy Res Inst IFPRI, 1988, ISBN 0896290670), 7. ↑ Paul Sinclair, Grameen Micro-Credit & How to End Poverty from the Roots Up, One World One People. Retrieved September 2, 2008. ↑ Shahidur R. Khandker, M. A. Baqui, & Khan Z. H. Grameen Bank: Performance and Sustainability (World Bank Publications, 1995, ISBN 0821334638), x. ↑ Susan F. Feiner and Drucilla K. Barker, Microcredit and Women's Poverty, Economic Affairs Bureau, Inc. Retrieved September 2, 2008. ↑ Daniel Perl, Michael M. Phillips, Grameen Bank, Which Pioneered Loans For the Poor, Has Hit a Repayment Snag, Wall Street Journal. Retrieved September 2, 2008. ↑ Ian Fraser, Cover Story, Microfinance comes of age, Scottish Banker Magazine. Retrieved September 2, 2008. ↑ 13.0 13.1 Development Gateway Foundation, Grameen Bank-Village Phone Wins Global Competition for Contribution of Technology to Development. Retrieved September 2, 2008. ↑ D. C. Barua, Five Cents a Day: Innovative Programs for Reaching the Destitute with Microcredit, No-interest Loans, and other Instruments: The Experience of Grameen Bank (Nova Scotia, Canada: Global Microcredit Summit, 2006). ↑ Grameen Bank, Historical Data Series 2003. Retrieved September 2, 2008. ↑ Grameen Communications, Credit delivery system. Retrieved September 2, 2008. ↑ 17.0 17.1 Nobel Prize, The Nobel Peace Prize for 2006. Retrieved September 2, 2008. ↑ AFP, Yunus unveils vision to end global poverty, The Daily Star (Bangladesh). Retrieved September 2, 2008. ↑ Ole Danbolt Mjøs, The Nobel Peace Prize for 2006: Presentation Speech, The Nobel Peace Prize for 2006. Retrieved September 2, 2008. ↑ The Daily Star, Nation parties on Nobel win. Retrieved September 2, 2008. ↑ The Independent, Credit where credit is due: The banker who changed the world. Retrieved September 2, 2008. ↑ Grameen Foundation, Grameen Foundation Annual Report 2006. Retrieved September 2, 2008. ↑ Charity Watch, Top Rated Charities, American Institute of Philanthropy. Retrieved September 2, 2008. ↑ Fast Company Monitor Group, Grameen Foundation USA. Retrieved September 2, 2008. ↑ Sudhirendar Sharma, Is micro-credit a macro trap? The Hindu. Retrieved September 2, 2008. ↑ Sudhirendar Sharma, Microcredit: Globalisation unlimited, The Hindu. Retrieved September 2, 2008. ↑ The Economist, A new party for Bangladesh's fray. Retrieved September 2, 2008. ↑ WebIndia, Hasina sneers at Nobel winner Yunus's bid to enter politics, Indo-Asian News Service IANS. Retrieved September 2, 2008. ↑ Nimal A. Fernando, Understanding and Dealing with High Interest Rates on Microcredit—A Note to Policy Makers in the Asia and Pacific Region. Retrieved September 2, 2008. ↑ Jeffrey Tucker, The Micro-Credit Cult, The Free Market. Retrieved September 2, 2008. ↑ Jeffrey Tucker, Microcredit or Macrowelfare: The Myth of Grameen, Mises Institute Retrieved September 2, 2008. Bornstein, David. The Price of a Dream: The Story of the Grameen Bank. New York: Oxford University Press, 2005. ISBN 0195187490. Cockburn, Alexander, "A Nobel Peace Prize for Neoliberalism?" Counterpunch 2006. Counts, Alex. Give Us Credit. New York: Crown, 1996. ISBN 0812924649. "Micro Loans for the Very Poor." New York Times. February 16, 1997. Sachs, Jeffrey. The End of Poverty: Economic Possibilities for Our Time. New York: Penguin Press, 2005. ISBN 0143036580. Yunus, Muhammad, and Alan Jolis. Banker to the Poor: The Autobiography of Muhammad Yunus, Founder of Grameen Bank. Karachi: Oxford University Press, 2001. ISBN 0195795377. All links retrieved July 8, 2017. Grameen II and Portfolios of the Poor MicroSave, June 5, 2010. This page was last modified on 8 July 2017, at 20:08.